It is an annotation which applies on a method or constructor that takes varargs parameters. It is used to ensure that the method does not perform unsafe operations on its varargs parameters. From Java 9, it can also be used with private instance methods. Note: The @SafeVarargs annotation can be applied only to methods that cannot be overridden. Applying to the other methods will throw a compile time error. Let's see some examples, in first example, we are not using @SafeVarargs annotation and compiling code . See, what happens? It produces warning messages at compile time, but compiles without errors. Note: SafeVar.java uses unchecked or unsafe operations. This is a compiler generated warning regarding unsafe varargs type. To avoid it, we should use @SaveVarargs notation to the method, as we did in the following example. Now, compiler does not produce warning message, code compiles and runs successfully. 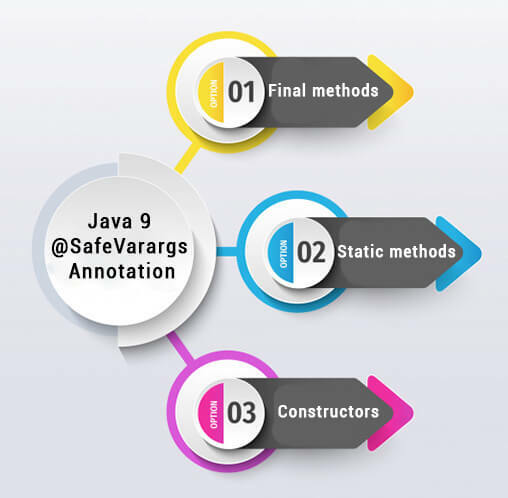 Note: To apply @SaveVarargs annotation on private instance methods, compile code using Java 9 or higher versions only. What happens? If we compile the following code by using older versions of Java. SafeVar.java:6: error: Invalid SafeVarargs annotation. Instance method display(List<String>...) is not final.